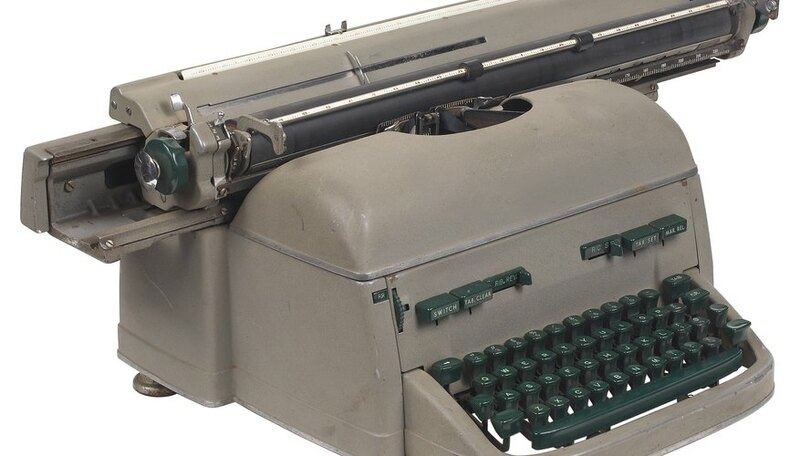 You may think of a manual typewriter as the computer's old-fashioned, less-capable grandparent, but in the right hands, it's an artistic tool. For seven decades, the late Paul Smith surmounted the challenges of cerebral palsy to create works using only the symbols on the top row of keys, typed with the shift lock engaged. Even young artists work in the medium, using different machines for different output styles. Whether you create simple doodles, cross-stitch patterns, portraits of pets and people, or elaborate landscapes, the techniques of typewriter artistry offer genuine expressive potential. Select a high-grade acid-free paper with no watermarks as your artistic medium. Insert a throwaway sheet into your machine and test for sticky keys or characters that don't create a complete impression. Oil and adjust the machine if necessary. Previsualize your drawing. You can sketch lightly on your typing sheet in pencil or draw on a backing sheet that you roll into the typewriter under your output material. Insert your paper into the typewriter and roll it into position. If you plan to create a simple drawing or can visualize your work without a sketch, add a blank backing sheet behind your typing medium to protect the machine's platen from key strikes. Begin at the top of your drawing. Work your way around the outer edge of the form you're creating. Matching the shapes of the letters, numbers or punctuation you use to create individual areas of the work to the texture or line style you're trying to render. For example, use the hyphen and underline to create strongly horizontal detail, the parentheses to build up wavy shapes, and the period or comma to add small dotted details. Add interior details. Use capital letters or digits to fill in shaded areas. Vary your fill-in characters to add detail to your shading. For a cross-stitched appearance, use the "X" as a filler. Save your work between sheets of acid-free onionskin paper or archival tissue. If you mail your artwork to others, insert it in the envelope between sheets of cardboard to protect it from damage. Choose a typewriter with a platen lock you can turn off so the platen rolls freely, rather than advancing vertically one line at a time. This helps you position your work at precise incremental positions. Select a machine that uses a two-color ribbon to add contrast to your work. Set tab stops where you plan to add specific details so you can plan your work in advance. Typewriter art uses up ribbons much more quickly than traditional typing does. Keep extra supplies on hand so you can switch if your ribbon begins to fade. Clean your keys with a typewriter brush or toothbrush to eliminate ink buildup. To prevent damage to the keys, avoid using sharp- or hard-bristled metal brushes. Leave your typing sheet in the machine unless you're sure you can reinsert it so you can resume work without adjusting the paper.